Grand ships from around the world glide into Lake Superior Harbor during the summer months. Watching them pass under the impressive Duluth Aerial Lift Bridge in Canal Park cannot be missed when visiting this summer. These behemoths sail through the bridge canal and are awesome to witness. Experienced ship watchers consult harbor schedules before waiting under the bridge for the vessels to appear on the horizon. It’s quite a show with the ships and bridge operators greeting each other with blaring bells and horns. And first time viewers will be amazed at the sheer size of the crafts. The peak ship watching season continues through summer, already a great time of year to visit Duluth. The Solglimt Bed and Breakfast, located right in Canal Park, has great Lake Superior views and easy walking access to the Aerial Lift Bridge. Find the best of comfort and luxury in our beautiful guest rooms, lovely gardens and multiple decks with amazing views. 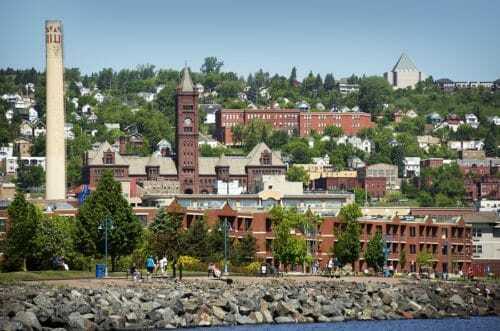 Book your getaway today and start enjoying all the summer fun in Duluth. Over 1,000 ships visit Duluth every year and the summer months are the most active. However, don’t count on just catching one coming through the canal. Planning ahead makes a more successful and relaxed viewing. 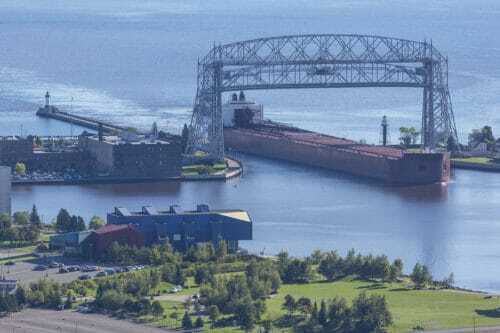 There is a new service from the Duluth Maritime Museum, call Harbor Lookout, which provides ship schedules, cargo information and country of origin. Now, our guests can schedule their day around a boat arrival through the canal. When you’re ready to watch these graceful boats pull into the harbor, head down to the Canal Park Neighborhood where the Aerial Lift Bridge is located. Leave yourselves plenty of time to catch the impressive ships coming into the harbor. By far the Duluth Aerial Lift Bridge has the best, close up views of the cargo vessels pulling into the canal. The ships are amazing but watching the huge counterweights raise the 900-ton span of bridge is quite impressive as well. When completely raised the bridge opens up to a clearance of 180 feet. This 100 year old engineering marvel was completed in 1905, and entered in the National Register of Historic Places in 1973. And during the busy summer months it’s lifted an average of 26 times a day. 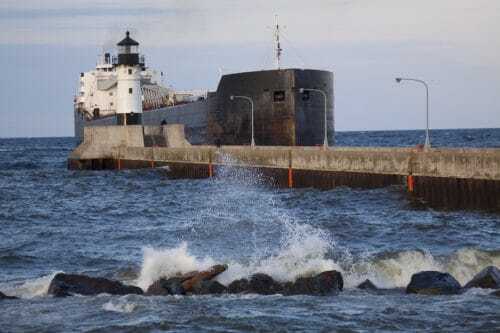 The two distinct types of ships that visit the port are named “Lakers” and “Salties.” 90% of the traffic comes from visiting “Lakers,” cargo carriers built for sailing the Great Lakes. They supply the Great Lakes St. Lawrence Seaway with bulk commodities such as iron ore, coal, and stone. These ships can be up to 1,000 feet long and carry up to 70,000 tons. While the “Salties” are a maximum size of 740 feet and regularly travel the 2,342-miles from the Atlantic Ocean to Duluth-Superior. Learn more about shipping history and get a close up look at one of these magnificent ships while touring The William A. Irvin. This preserved ship, permanently docked in the Duluth harbor, offers tours that transport you back in time. From 1938 until 1975 it was the flagship of the US Steel Great Lakes fleet. It carried tons of iron ore and coal while braving treacherous storms. Visit the pristine historic ship in the heart of Canal Park and discover its rich history. Also learn more about Duluth’s shipping history at the Lake Superior Marine Museum. These awe inspiring leviathans are a wonder to see with your own eyes. And that’s why tourists and locals alike gather under the Aerial Lift Bridge to observe their arrival. With their immense size, booming horns and soaking waves, the experience engages all the senses. Add witnessing this piece of living history and local pride to your summer visit to Duluth. Reserve your room at the Solglimt Bed and Breakfast today before summer slips away!